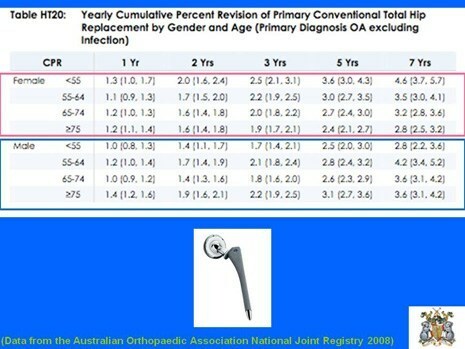 The following data is from the 2008 publication of the Australian Orthopaedic Association National Joint Registry. 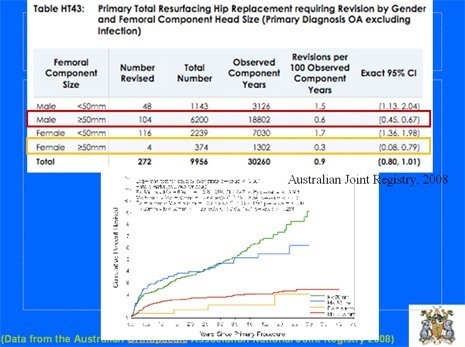 This is the largest source of information comparing total hip replacement (THR) with hip resurfacing arthroplasty (HRA), as both procedures have been in use in Australia for approximately 7 years. A registry means that it encompasses information about every hip arthroplasty procedure performed in this country, with mandatory reporting from its surgeons. Furthermore, any patient requiring a revision operation is also included (unless they had the procedure done in another country). This provides a large amount of information that can be analyzed for many different variables. 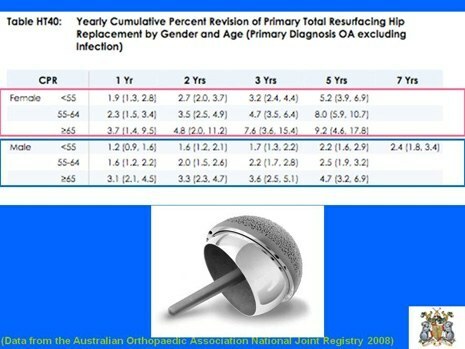 However, please keep in mind that the registry does not report statistics on dislocation, which is a more common complication after total hip replacement, generally reported to be between 1-2% of patients. These two tables show the revision rates for THR and HRA stratified by age and gender. The first point to notice is that revision rates for both procedures is extremely low-that is, most patients do very well. 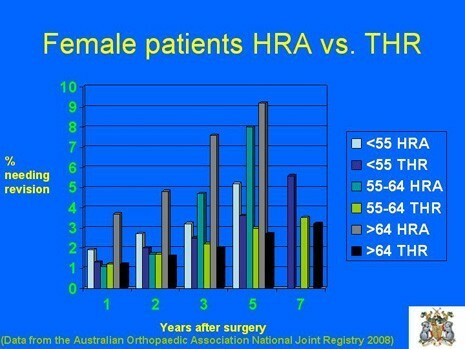 The second point to notice is that females have a higher revision rate with hip resurfacing than males. Thirdly, younger patients have lower revision rates with hip resurfacing than older patients. Interestingly, with THR on the other hand, as patients get older, the revision rates decrease. 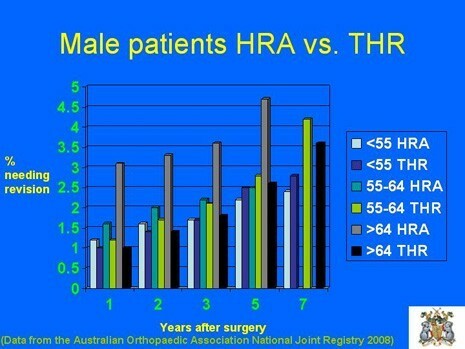 If we look at this data for men in a graphical format, we can see that for men under the age of 65, there is actually a lower revision rate for hip resurfacing at 5 years! 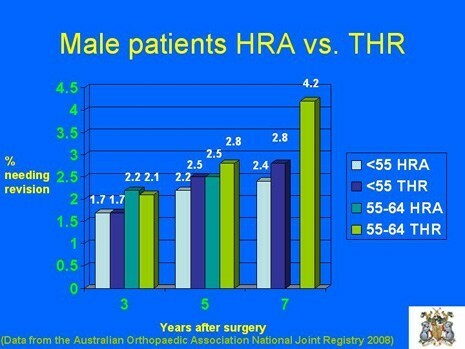 This is why in a younger age population, a hip resurfacing may be preferable to a THR. This is an enlarged picture of the previous graph, with numbers assigned to each bar. It shows the exact differences in the procedures for each age group. This is a graphical representation of the data for female patients. At every timepoint, there is a higher revision rate for HRA as compared to THR. This table shows a comparison of revision rate by gender and size. Many people believe that the poorer results of hip resurfacing in women are due to sizing issues. That is, women tend to have smaller bones, and thus less bone to support an implant. Since the bony foundation for an implant is more important in hip resurfacing, this translates to poorer results. This table stratifies the results into <50mm head and >=50 mm femoral component size. As you can see, the results of a 50 mm femoral head size are better for both men and women.